Here at the Funny Names Blog, we spend a fair amount of time evaluating the relative radness of various names. Sometimes, it’s hard to choose between two awesome names, so it’s always a treat when we can point to some objective reason that one name is more awesome than another. The NCAA Women’s basketball tournament final last week gave us another chance to use this non-scientific (though highly majestic) method for determining the relative might of two monikers, when Kimberly Duane Mulkey‘s Baylor Bears defeated won 80-61 over the Notre Dame Fightin’ Irish team coached by Muffet McGraw. 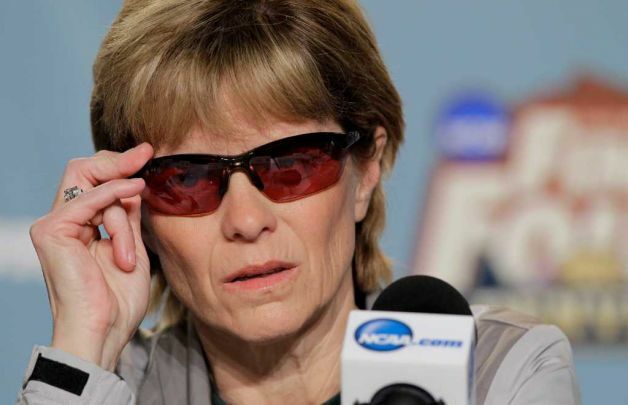 Both coaches have impressive credentials – McGraw has four Final Four appearances and a national championship during a 25-year coaching career, while Mulkey is a member of the women’s basketball hall of fame who won two championships and an Olympic gold medal as a player and has now compiled 300 wins and two national titles as a coach. The Notre Dame Fightin' Irish logo: Perhaps all disputes should be settled by fisticuffs. Based purely on nomenclature, I would have a hard time not favoring a person named Muffet, and this line of argument was strengthened by the fact that she coaches a funny-named team called the Fightin’ Irish, whose most famous coach – the late Knute Rockne – will someday grace the pages of this blog as well. However, deeper digging (note to self: use this as a pun in my Bone Wars article) uncovers the shocking truth: although known professionally as Muffet, Ms. McGraw’s actual first name is Ann, and Muffet is just a nickname! Funny Name Theory: The Muffet McGraw Rule – When a person with a funny legal name squares off against a person with a funny assumed name, the legally-named individual shall take precedence. 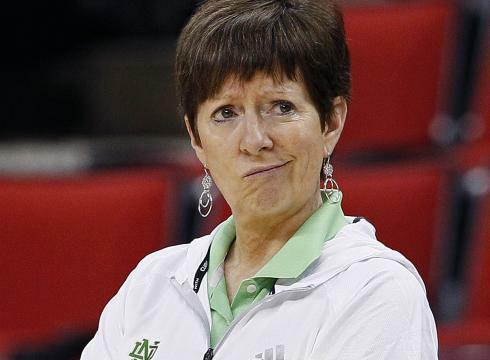 Muffet McGraw is visibly dismayed by this new development in Funny Name Theory. This explains why Livingstone Bramble stopped winning after changing his name to Ras-I Alujah Bramble, and why Vermin Supreme has struggled to establish a political foothold anywhere other than his boot-covered head. Then again, Kimberly Duane Mulkey’s success could be due to the fact that she is the coach of basketball phenom Brittney Griner – the greatest dunker the women’s game has ever seen. In any case, congratulations to Mulkey, Griner, and the Baylor Bears on their national title and the first 40-win season in college basketball history! This entry was posted in Uncategorized and tagged basketball, comedy, funny, funny names, humor, ncaa, women's basketball. Bookmark the permalink. Haha, questions of the ages! I’m guessing it has to do with the “Little Miss Muffet” nursery rhyme, but I agree, it’d be hard to make it stick! Brilliant – in the UK you can “muff it” a shot i.e. miss badly – perhaps Muffet’s Dad was a poor shot with the old gametes? Haha, maybe, although clearly he did something right – Muffet grew up to be quite a lady! Thanks for the visit. I have your blog in my feed and I really enjoy it! Funny Name Theory, I like it.